Sunrise Farm is a restored 1890 Victorian Farmhouse Inn surronded by scenic lakes, forests and waterfalls in the high foothills of the Blue Ridge mountains. Guests can choose from four farmhouse rooms with private bath, or two cozy cottages with kitchen, fireplace, bedroom and bath. Guests enjoy a sumptuous country breakfast by the dining room fireplace each morning, and they are also invited to enjoy the beautifully decorated parlor and fireplace. 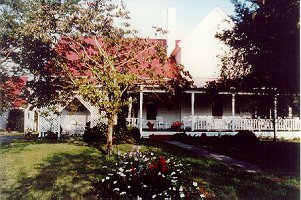 Each room features unique family antiques, handmade quilts and all the comforts of a country home. We welcome families and children, and well-behaved pets. We accept personal checks, Visa and Mastercard Ask about our packages for a variety of area activities such as golf, boating, horseback riding and white water rafting. We also offer a Celebration Package, and Procrastinators Package. Price Range: $80-100 per couple, includes breakfast. This and other Salem Bed and Breakfast Inns can be found here in The Register.